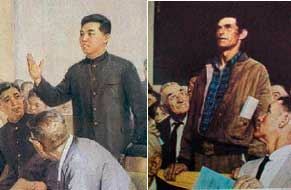 This North Korean propaganda poster, entitled, "Criticizing and Exposing Collaborators" parrots Norman Rockwell's famous painting "Freedom of Speech." You assume it is blindly so. You must be new to HogueProphecy bulletins and my books. You have initiated this Australian Barbie debate unarmed with knowledge about my long sustained and critical views about European American crimes against America’s own native peoples. You would have known that I stirred a Tasmanian Devil’s nest of ire over here constantly reminding people in my homeland what they did and got away with instigating a holocaust on “our” aboriginals. You ought to know how that is, writing from Australia. We generally got away with our holocaust; you are getting away with yours Downunder. Consider the persecution and systematic destruction of culture and the ongoing genocide of “your” aboriginals. I have lived in Australia. I have seen first hand what your Euro-Aussie blokes get away with. Just because it is “outback” and removed from view, just because it is on a far smaller scale than the German Jewish or the American Native Holocaust, does not hide your country’s ongoing crime from my scrutiny. I guess Australians will never match our crime in sheer numbers, yet OZ does match “US” in spirit and in our all-American European righteous hypocrisy. So, if you are going to throw stones I playfully invite you to stand farther away, out of the greasy smoke of the barbie and see my work in a clearer light. Let us push the button called “enslaved victim” who could not flash a “tilt” of protest without pushing the corresponding button of codependency called “enslaving victimizer.” We are not these button labels, even if we are hypnotized by our resident education conspiracies of national and tribal mesmerism to identify, fight and even die for buttons. …What have you to say. Do you really believe this nation is qualified to dictate terms or police this planet? Whilst their own history drips with the blood of innocents, and their influence throughout the world is but nothing more than the sip of the poisoned chalice. Oh what a lot of gush, Haris. If the readers want to see the whole lengthy extent of your turgid narrative about American crimes they can read it at the comments section below the article Kim Jong Il has No Dong. Haris, you seemed to have missed the point. [Hogue] is not criticizing the North Korean people for their suffering. He is simply pointing out the facts (the real story) about their leader. “THE GREAT DONG”. What is you point Haris? I must agree with Achintya. You rambled off the point from the first sentence to the displayed fourish quoted above. The article was about that nitwit of dictators oppressing the North Korean people. May he show his weak hand in history’s gamble and pass on soon. May the North Koreans need only endure one last dark time of national implosion before better times and perhaps better programming comes. I say “perhaps” because new programming is not what anyone needs but it happens. Perhaps when the prison mind-set of Kim’s Stalinist hermit kingdom is replaced by a more comfortable mind-prison called “united Korean democracy” some individuals may have a better chance freeing themselves from all programs and become conscious of their divine spark. Some prisons feed their inmates better, give them more toys, a library, more chances to expand their minds behind cell phone bars, etc. As long as people stay identified with their harsh or luxurious national prisons and revel in their political chains — fascist, socialist, communist or democratic — they will not know themselves and govern themselves with enlightenment. I write these blogs to provoke you all. I work very hard to unsheathe your programmed buttons and give them a push. It is not done to hurt you, but to awaken you and awaken me. This entry was posted in Geo Politics, North Korea and tagged East Wind, Fava beans, Hannibal Lecter, holocaust, Kim Jong Il, missiles, Native Americans, No Dong, North Korea, predictions, Thanksgiving. Bookmark the permalink. Post a comment or leave a trackback: Trackback URL.